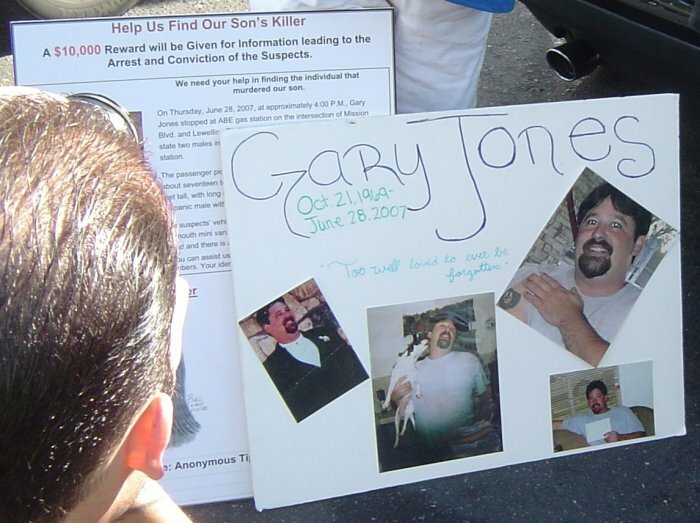 Please help us find Gary's Murderer. He is still at large and may kill again. DO NOT REMAIN SILENT ANY LONGER ... CLAIM YOUR RIGHTFUL REWARD ! 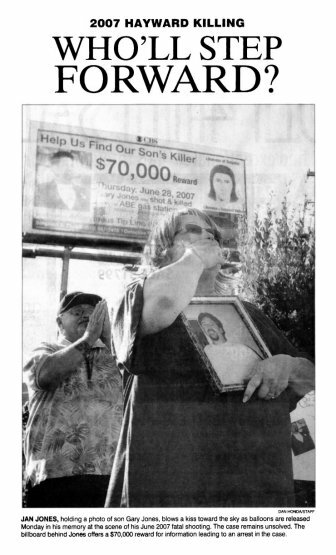 PLEASE ... HELP US and yourselves by getting my son's murderers off our streets ... (it could just as easily have been your son or daughter). 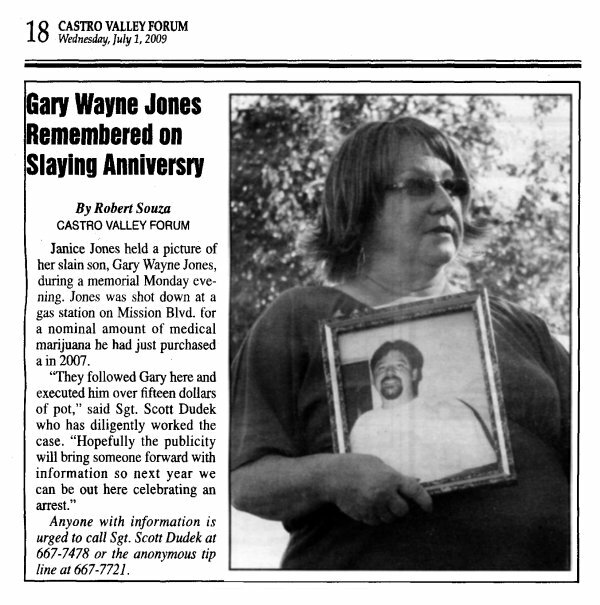 My son, Gary Jones, on his way home from work, had his young life senselessly taken while stopping for gas at the ABE gas station at the intersection of Mission Blvd. and Lewelling Blvd. 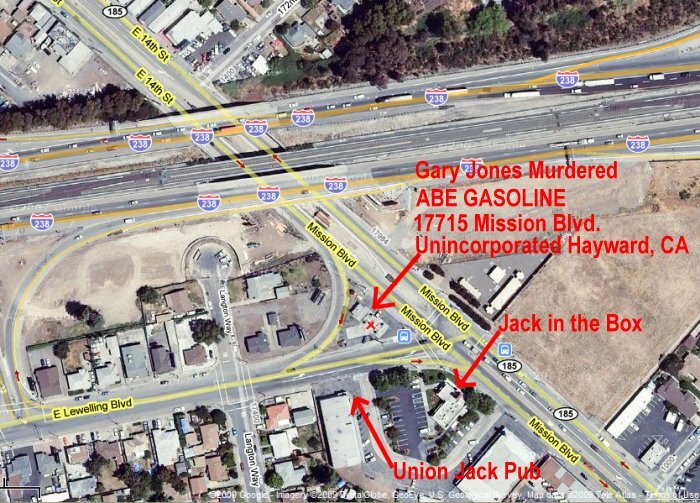 Witnesses state two males in a mini van shot and killed Gary while at this gas station. 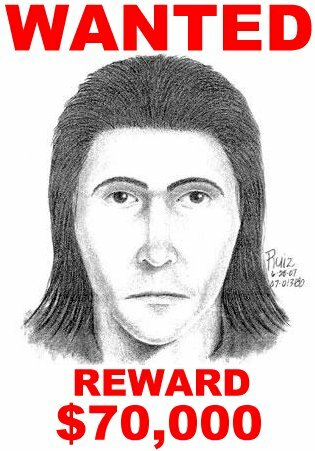 The suspect is described as a Hispanic male, about 17 to 20 years old, five feet eight inches to six feet tall, with long dark hair, and the driver is described as a Hispanic male with a mustache. If you can assist us with information, please call one of the following numbers. Your identity can remain anonymous. HAYWARD, Calif. -- On Monday night, family and friends came out to remember Gary Jones who was killed two years ago after he was followed as he left a cannabis club in Hayward. 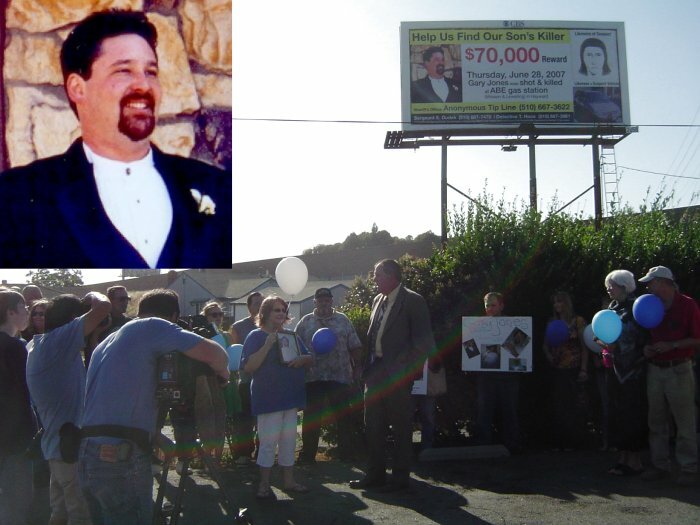 The Alameda County Sheriff's Department expressed hope that renewed attention will help them solve the crime. Sgt. Scott Dudek says he is frustrated by the case. 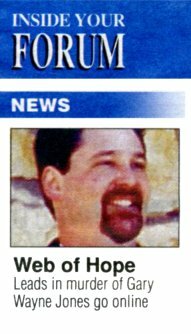 "I wish I could wave that magic wand and say 'Hey, this is who did it,'" Dudek said. 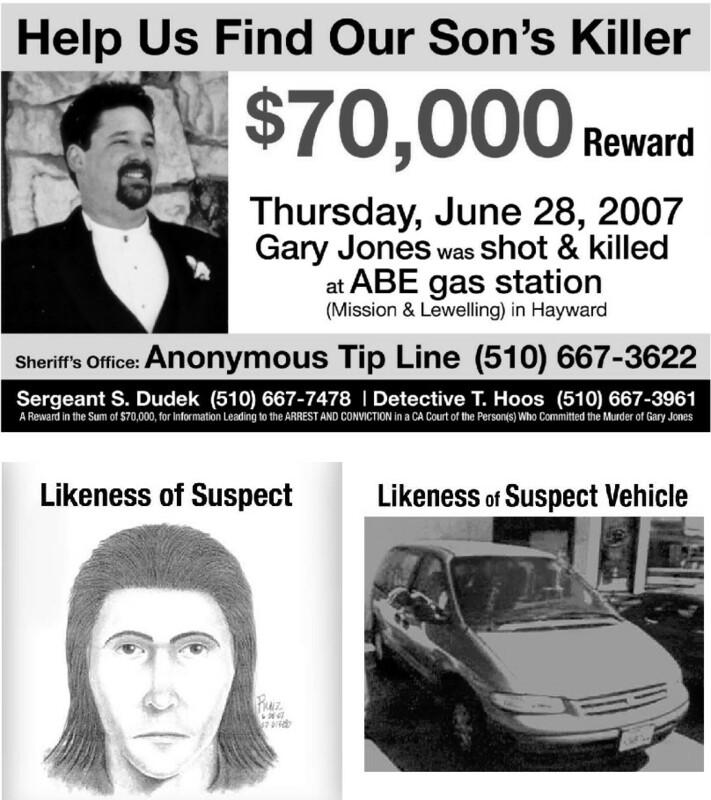 The effort to develop new leads in the senseless 2007 murder of Gary Wayne Jones of San Leandro has been expanded to the World Wide Web. 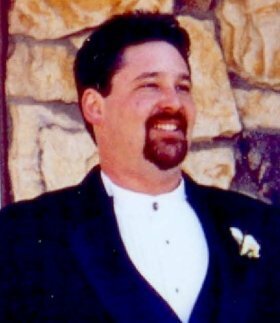 Jones, a 38-year-old cabinetmaker, was gunned down on June 28, 2007 at the ABE gas station on Mission Blvd. for a small package of medical marijuana he had just purchased legally from the nearby Compassionate Cannabis Club. The assailant and another man had apparently observedthe sale from their car and sped off seconds after the shooting and robbery. please call one of the following numbers. Your identity can remain anonymous. Thank you to the contributors to Gary's reward fund. 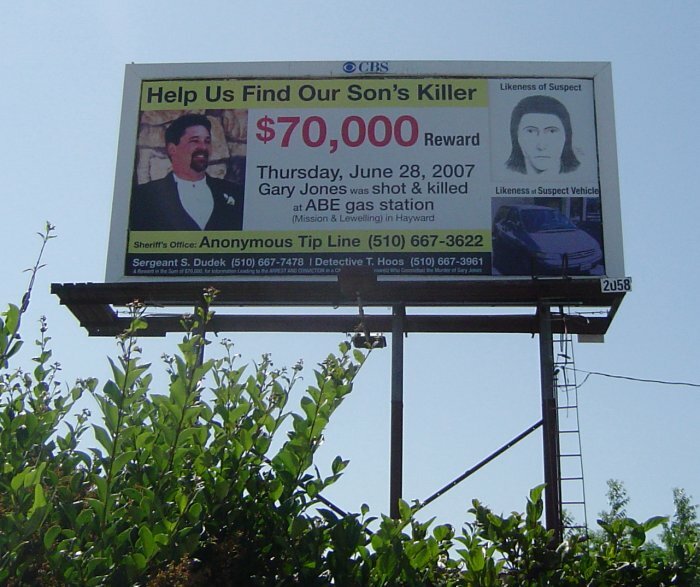 A special thanks to CBS Outdoor, Alameda County Supervisor Nate Miley and the Alameda County Sheriff's Department for sponsoring this billboard.